Carlton Plummer grew up on a farm in Maine before serving as a war combat artist in Vietnam and becoming a university professor. Sandy Crabtree married a Mainer and taught art at Morse High School for 30 years. 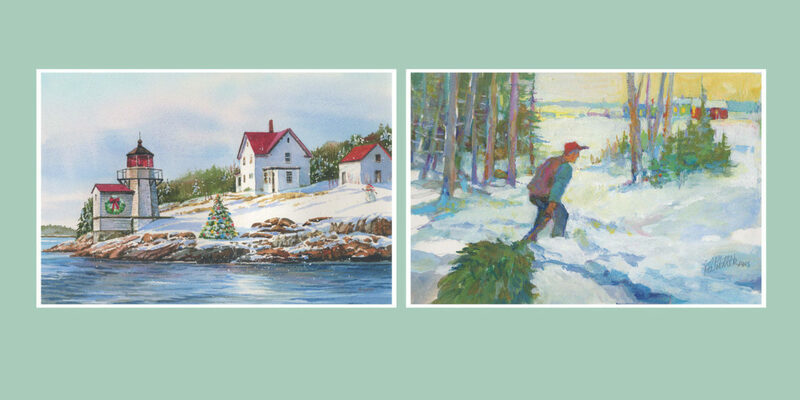 What they both share in common is their artwork has helped raise more than $3 million dollars to support Maine people with disabilities through Pine Tree Society’s annual holiday card campaign. Plummer already has seven paintings featured on Pine Tree Society holiday cards. This year, at 88 years old, he’s added an eighth. His painting “Homeward Bound” has been selected as a design for this year’s card. Crabtree’s painting “Squirrel Point” was selected as well, marking her tenth time being featured in this annual tradition. Plummer’s watercolor scene titled “Homeward Bound” features a man making his way home after harvesting the perfect Christmas tree. He moves through the rugged landscape of the snow-covered forest on his way to the quaint town in the clearing where his family eagerly awaits his arrival. This painting harkens back to a childhood memory on his grandparents’ farm. Crabtree’s “Squirrel Point” is a captivating watercolor of a beloved Maine lighthouse. On a clear, brisk day on the Kennebec River, Squirrel Point Lighthouse is festively adorned with a wreath, a Christmas tree, and a jolly snowman waving from the hill. Crabtree loves lighthouses. She also loves tree houses. Crabtree hopes the holiday cards help raise awareness about the importance of saving things that matter, like Squirrel Point Lighthouse and like the tree house at Pine Tree Camp. Plummer recalled that he first year his artwork was selected, he had submitted a painting because he thought the whole concept was a good idea. It all began with a knock on the door. In the 1960s, Pine Tree Society staff had the idea that a Maine-themed holiday card could be the perfect fundraiser. Maine artist Richard Hasenfus lived nearby the office, so they knocked on his door and asked if he would donate a piece. More than fifty years later, the tradition is still going strong. Every June, Pine Tree Society’s office is flooded with paintings depicting Maine’s beautiful landscape. This annual holiday tradition draws work from artists from around the state competing for a chance to be featured in Pine Tree Society’s expansive collection of Maine art representing all aspects of Maine in the winter — from country scenes, to woods and fields to the rockbound Maine coast.